5 Characters in Come From Away! Come From Away First National Tour! Complete casting has been announced for the forthcoming touring production of the award-winning musical Come From Away, which will begin performances at Seattle’s 5th Avenue Theatre in October. The production will star Kevin Carolan (Newsies), Harter Clingman (Peter and The Starcatcher), Nick Duckart (In the Heights), Chamblee Ferguson, Becky Gulsvig (School of Rock the Musical), Julie Johnson (Memphis), Christine Toy Johnson (The Music Man), James Earl Jones II (The Gershwin’s Porgy and Bess), Megan McGinnis (Les Misérables), Andrew Samonsky (South Pacific), Danielle K. Thomas (Avenue Q), Emily Walton (August Osage County), Marika Aubrey, Jane Bunting, Michael Brian Dunn, Julie Garnyé, Adam Halpin, and Aaron Michael Ray. 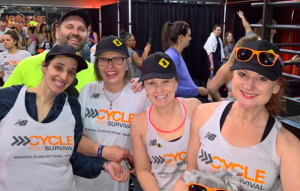 Joining The Australian Community 2018 Cycle for Survival team, and raising over $5000 for rare cancer research! 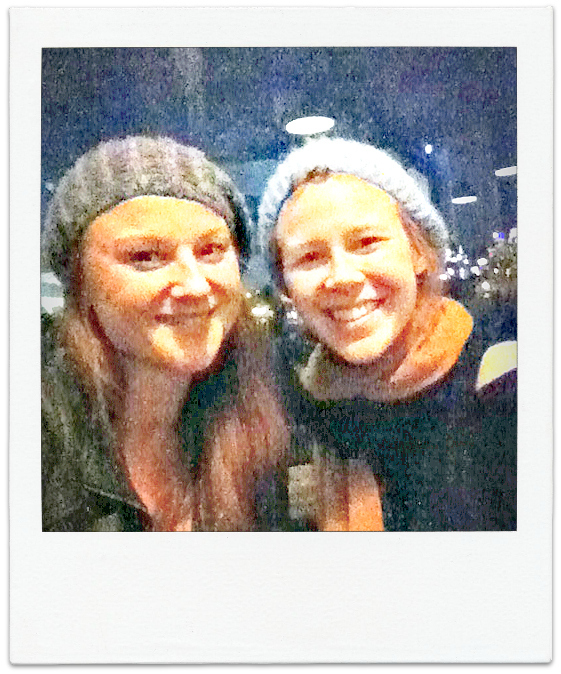 The Australian Community NYC team! 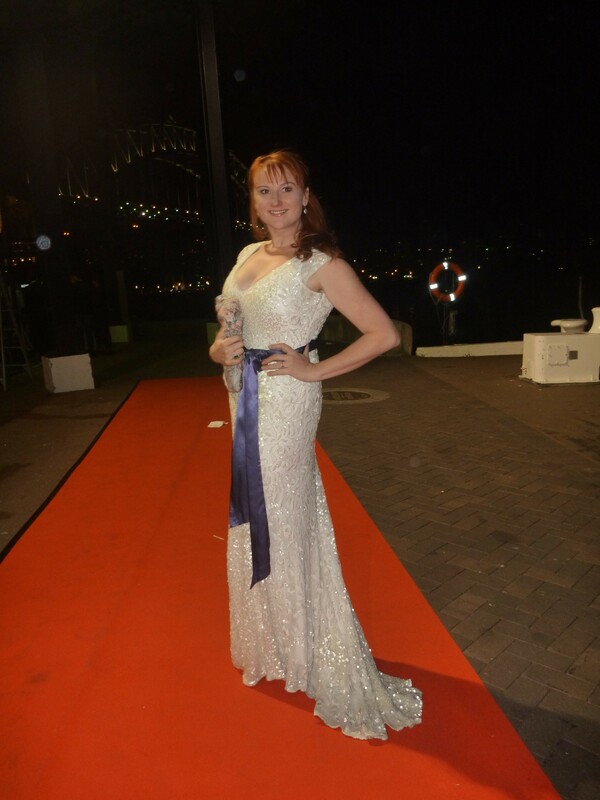 On Friday January 26th 2018 The Australian Community will be recognizing the talents of Australian performing artists at an awards ceremony at Pier A in NYC. The main Honorees will be Sullivan Stapleton & Stella Pulo, the first Australian to be honored with lifetime membership into The Actors Studio. In addition, the evening will include an awards ceremony to recognize the contributions of Amanda Bishop, Ben McHugh, Marika Aubrey, Nick Hardcastle, Kaye Tuckerman and Jeremy Youett. A special performance will be made by Australian classical guitarist Rupert Boyd, and Top 100 Australian hits will be playing throughout the evening. Huge thanks to all of you for all your support in 2017! Love the ongoing connections we find online built upon the connections made in the magic of work. Wishing you a festive season that is of your own perfect design, be it a time of release, a time for family, some silly fun, or some simple quiet catch up. Whatever your yuletide needs to be, may it be safe and yummy. I look forward to more adventures with you in 2018! On September 16th, a memorial was held at Bowling Green for the 10 Australians who perished on 9/11. 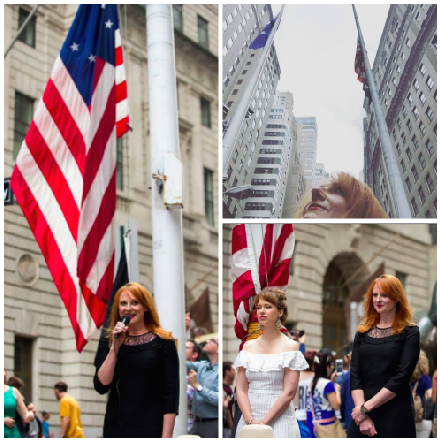 Singing ‘The Star Spangled Banner’ & ‘Advance Australia Fair’, alongside Mandy Bishop. 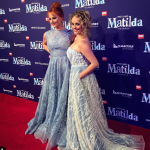 The Australian Production commenced performances in Sydney in July 2015 and Australian audiences immediately fell in love with the show, which went on to play Melbourne, Brisbane, Perth and Adelaide, where the tour will end for Australian audiences, having played over 750 performances. 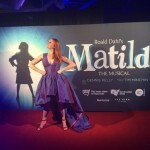 The Most awarded musical in Australian show business history, Matilda The Musical has been the recipient of close to 100 international awards, including 16 for Best Musical. 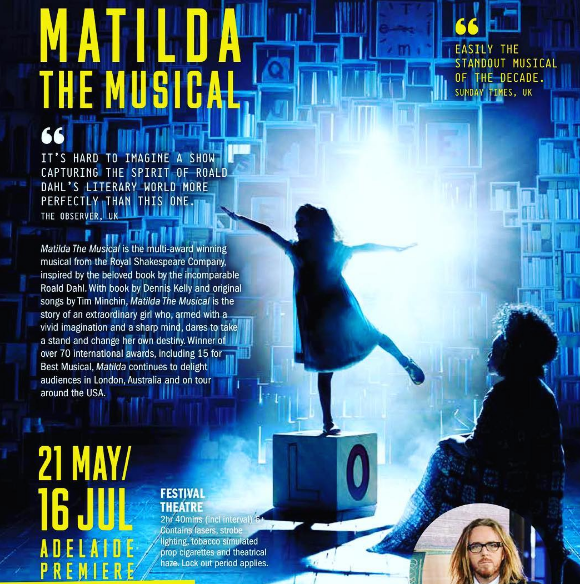 With book by Dennis Kelly and original songs by Tim Minchin, Matilda The Musical is the story of an extraordinary girl who, armed with a vivid imagination and a sharp mind, dares to take a stand and change her own destiny. The Daily Review described the production as “nothing short of a miracle”. The Australian said the show “makes you want to punch the air with delight.” and Time Out Sydney pronounced the show “a freaking masterpiece”. 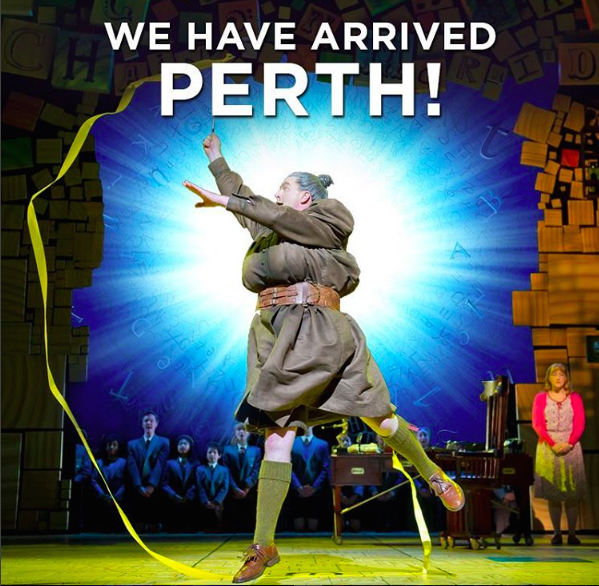 Matilda the Musical opens in Adelaide! 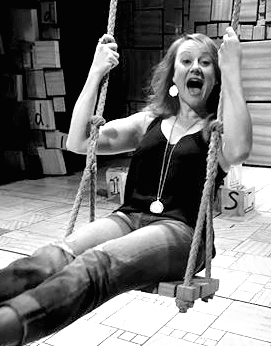 The story about the little girl with big dreams who tells us “sometimes you have to be little bit naughty” lands on centre stage at the Adelaide Festival Theatre this week. 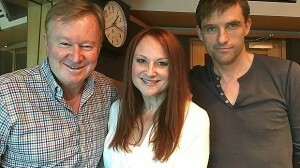 Two of the adult stars who bring the evil to Matilda’s story, James Millar and Marika Aubrey came in to the ABC studios to talk to to ABC Radio Adelaide’s Matthew Abraham and David Bevan. The Adelaide Cabaret Festival 2017 line up! 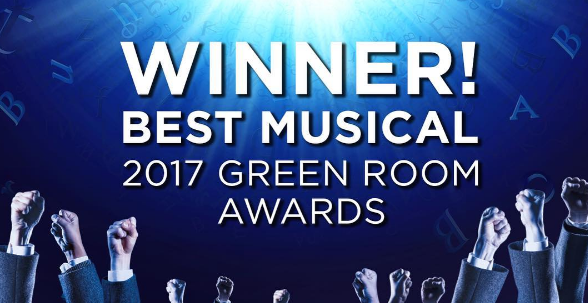 Matilda wins 8 GREEN ROOM AWARDS! 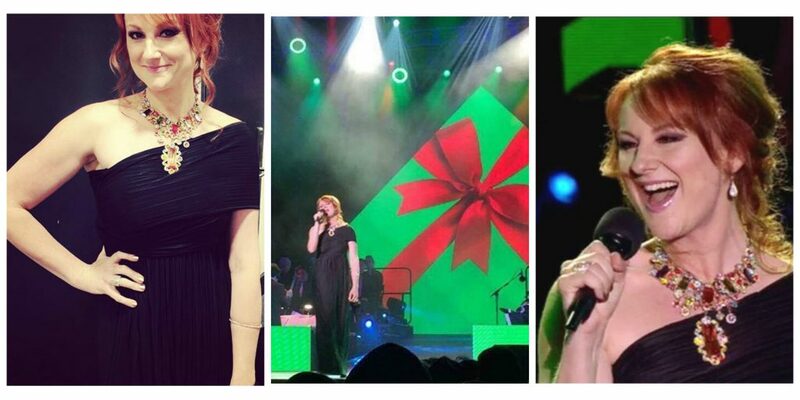 Ring in some Christmas joy at the Lord Mayor’s Christmas Carols. The Carols are a much-loved free family event in support of Mater Little Miracles. Join some of Australia’s renowned singers and entertainers including musical theatre icon Rhonda Burchmore and Luke Kennedy, cabaret performer Naomi Price, six-time Golden Guitar winner Melinda Schneider, ABC Kids band Lah-Lah, Marika Aubrey from hit musical Matilda, Opera Queensland star Rosario La Spina, Anna-Maria La Spina, The 7 Sopranos, The Koi Boys, Reece Mastin, Jess & Matt and Australia’s Junior Eurovision star, Alexa Curtis. International guests include oud virtuoso and composer, Joseph Tawadros and Nebraskan soul and blues singer, Angela Fabian. The carols orchestra and choir will be conducted by music industry celebrity John Foreman (OAM), joined by guest ensembles Voices of Birralee Children’s Choir, Camerata of St John’s Queensland Chamber Orchestra and Vocal Manoeuvres Carols Choir. Tis the season for giving! 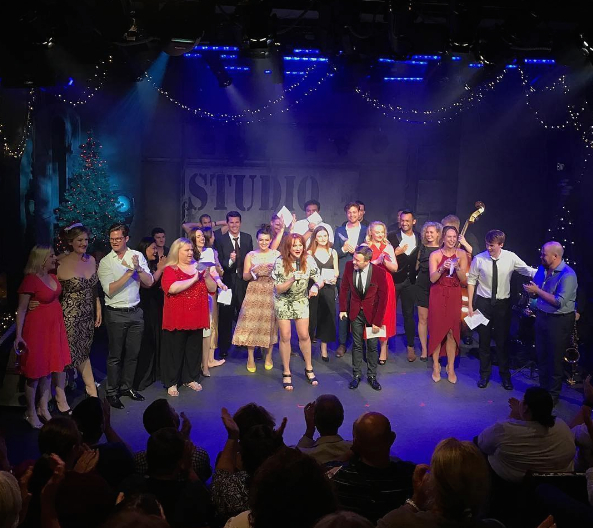 And so it was time for the Annual Carols By Cabaret at the Hayes Theatre, raising money for The Wayside Chapel, and celebrating another year of outstanding theatre making! This year we raised a whopping $9,296.63 in ONE SHOW – our biggest donation amount yet! 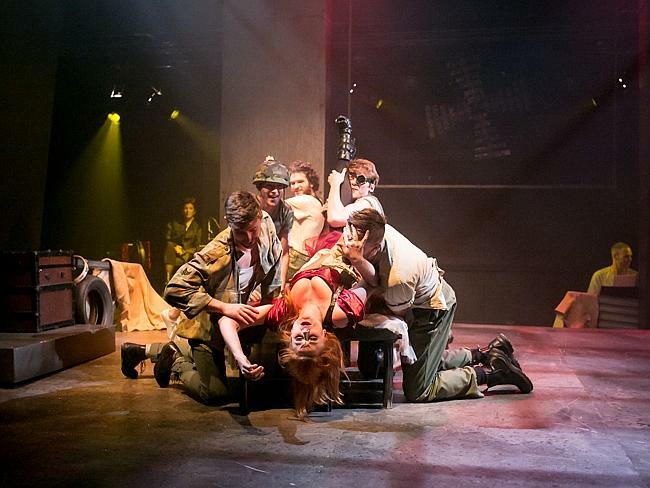 “…the Australian cast has this uncanny ability to tread the line between light and darkness so well. They get it – the Dahl humour and my humour…And it has done so well. It’s playing on the West End and Broadway right now. 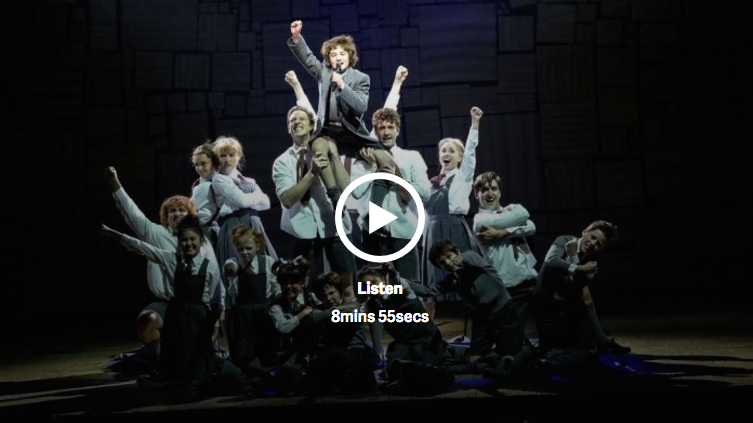 It will run for years and it might go around more than once.” – Tim Minchin. 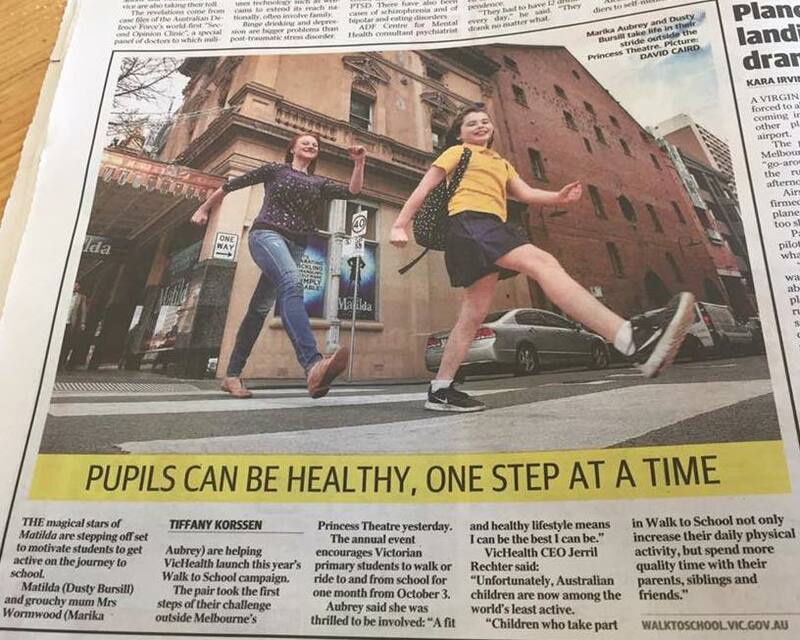 Introducing the local ­Matildas – Izellah Connelly, 9, Annabella Cowley, 10, ­Venice Harris, 9, and Eva Murawski, 10. 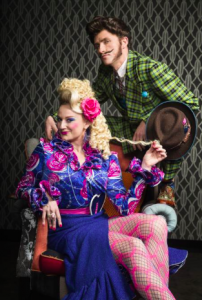 The adult cast features Marika Aubrey as Mrs Wormwood, Daniel Frederiksen as Mr Wormwood, Elise ­McCann as Miss Honey and James Millar as Miss Trunchbull”. 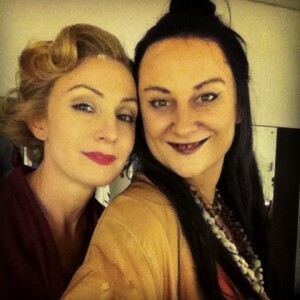 “MOST nights at the interval the “standby” Matilda shares a cup of tea with Marika Aubrey. 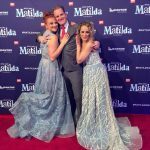 MATILDA THE MUSICAL wins a record 13 Helpmann Awards!!! The hit musical, presently playing at the Princess Theatre, received a record 13 nominations and won all 13 awards, including the most coveted award of Best Musical. 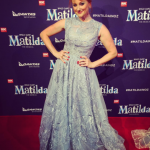 The Helpmann Awards are Australia’s highest performing arts accolade. Dan FrederiksenÂ and Marika AubreyÂ play Mr and Mrs Wormwood in the stage production ofÂ Matilda.Â They joined Denis Walter in the 3AW studio on May 17th to talk about what it’s like to lead a large cast of children. 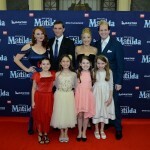 MATILDA AND ME airs on ABC Australia! April 3rd, this documentary (made by Tim’s sister Nell)Â wentÂ to air on ABC. 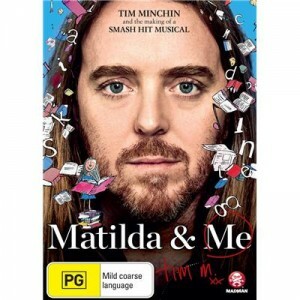 With exclusive access to the Australian rehearsals of his global theatre hit, MATILDA & ME charts the relationship between Tim Minchin and the musical he has become famous for. From London and Los Angeles to the opening night in Sydney, this is the story of the irreverent comedian whose unlikely partnership with the esteemed Royal Shakespeare Company proved the opportunity of a lifetime. You’ve been revolting! Last show in Sydney Feb 28th 2016! Nominations for some awards which is a bit nice. (Miss Honey got nominated too AND Mr Wormwood AND Miss Truchbull AND the show AND all four of the Matildas are receiving a special award!!! 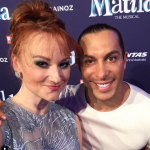 #goTeamMatilda!). You can read all the nominations (Man of La Mancha got some noms too!! )Â HERE. Both Man of La Mancha and Matilda got nominated for GLUGs too, as well as many of the cast. 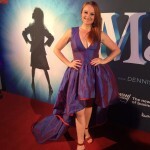 NEWCASTLE-raised actress Marika Aubrey has been nominated in the 2015 Sydney Theatre Awards for Best Actress in a Supporting Role in a Musical for her role in Matilda as Mrs Wormwood, the mother of the title character. 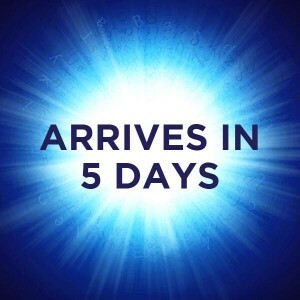 The Sydney Theatre Awards, with the nominees and winners chosen by 10 theatre critics, will be announced on January 15. 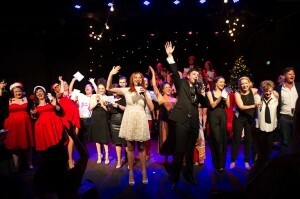 CAROLS BY CABARET ONSALE NOW!!! It’s back! 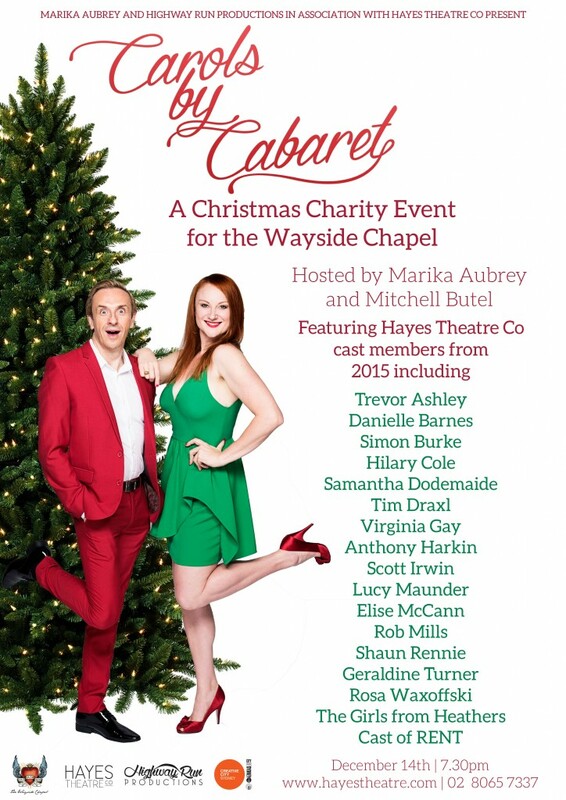 It’s the most wonderful time of the year and once again Marika Aubrey and Highway Run Productions deck the Hayes Theatre Co halls for one-night onlyÂ with Carols by Cabaret in support of local Potts Point institution, The Wayside Chapel. Hosted by Mitchell Butel and Marika Aubrey, and featuring Trevor Ashley, Danielle Barnes, Simon Burke, Hilary Cole, Samantha Dodemaide, Tim Draxl,Â Virginia Gay, Anthony Harkin, Scott Irwin, Lucy Maunder, Elise McCann, Marney McQueen, Rob Mills, Shaun Rennie, Geraldine Turner, The Girls from Heathers, and The Cast of RENT. This unofficial musical theatre Christmas party is stacked larger than Santa’s sleigh and at least twice as merry! 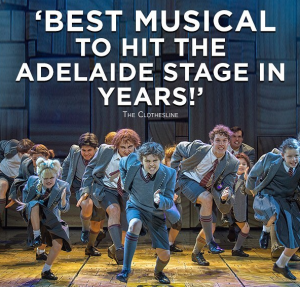 Following critically acclaimed seasons in London’s West End and Broadway, Matilda the Musical has finally made it to Sydney in all its nostalgia-fuelled glory. The story of a remarkably clever little girl with magical abilities kicking back against neglectful parents and a treacherous headmistress has inspired adoration by multiple generations, but has the musical theatre treatment done it justice? I spoke to Marika Aubrey, the woman stepping into the glittery six-inch heels of Mrs Wormwood (our protagonist’s mother), ahead of witnessing the show for myself at the Lyric Theatre. 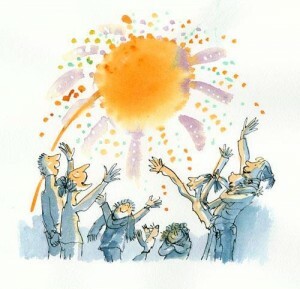 In her everyday life Aubrey says she is very much a “Matilda at heart”, with her love of books and quiet. “Her delusional sense of vanity and self belief is so ‘out there’ and so bold it has asked a lot of me to be that confident,” she says of her boisterous role. She could have fooled me–witnessing the statuesque Aubrey sauntering onto the stage in an almost offensively bright and ruffled salsa-dancing outfit, towering grotesquely over the other members of the cast with a broad English accent and a wig sitting six inches off her head, you’d never suspect that she had any reservations about playing this delightfully vain villain. “I think there’s something very challenging about remaining true and realistic in a heightened role–when you are playing something that on the surface is very loud and is very bold, and is very broadly comic… you must keep it truthful and real, otherwise its pantomime, and you never want it to be pantomime,” explained Aubrey. 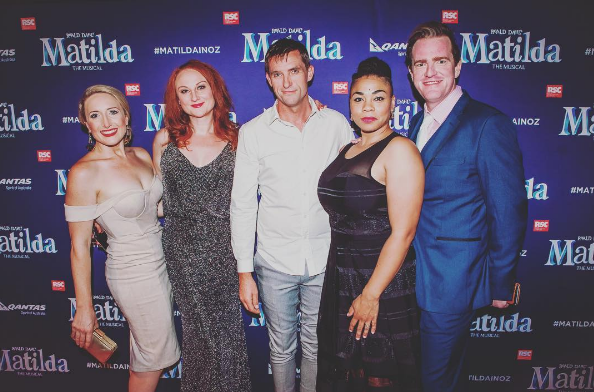 On August 20th, MATILDA THE MUSICAL officially opened at The Lyric Theatre, Sydney, followed by a big ol’ party with everyone who worked so hard to bring this miracle to life. To book a ticket to the show, click HERE. To read reviews and stuff, pop along HERE. 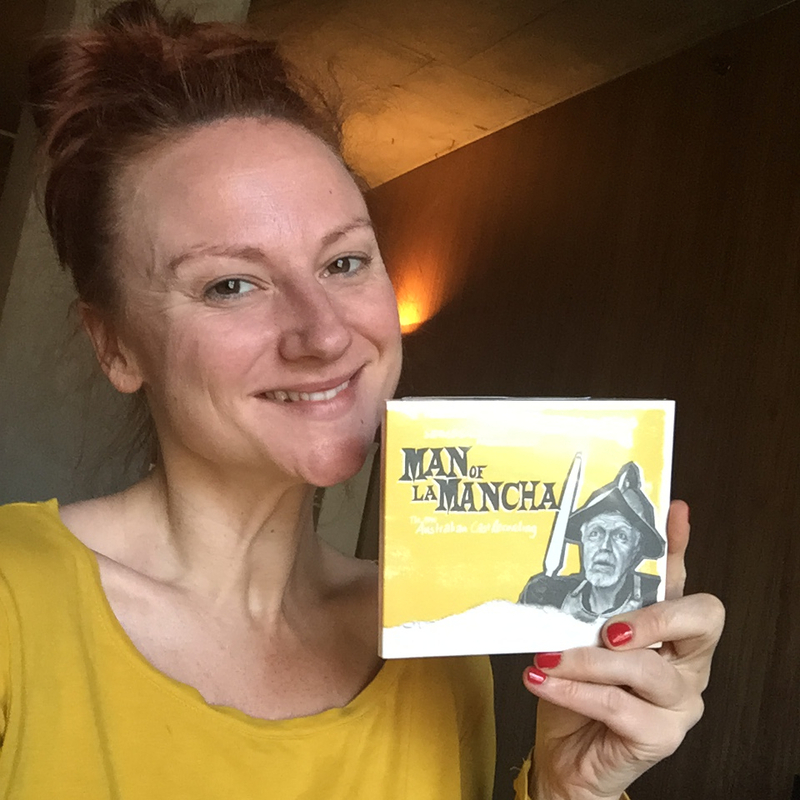 MAN OF LA MANCHA ALBUM is released! 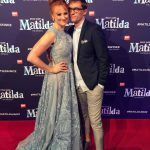 Everyone in team Matilda Australia is very excited to share the giddy happenings behind the gates of Crunchem Hall from JULY 28 at The Lyric Theatre, Sydney. 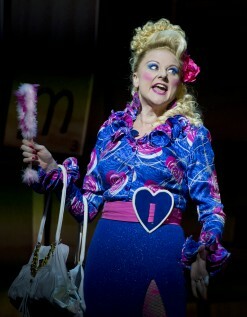 With Marika Aubrey as Mrs Wormwood! 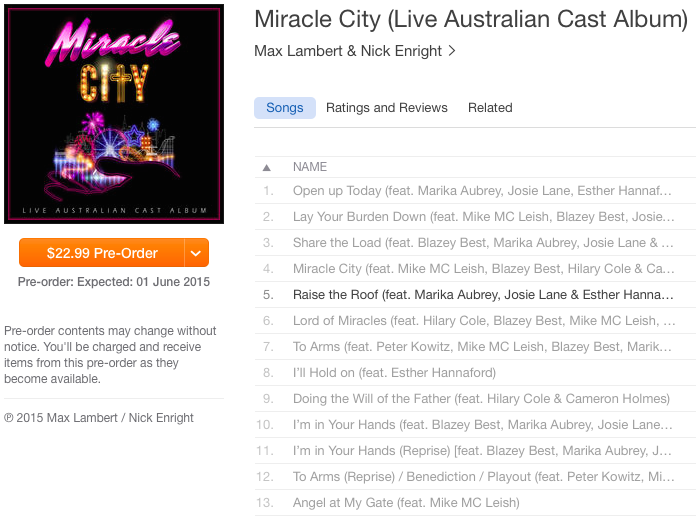 The MIRACLE CITY Live Australian cast album is now available to pre-order on itunes! MAGGOTS! Huge news! 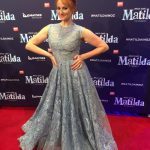 Marika Aubrey will be joining the cast of the highly anticipated musical MATILDA as Mrs Wormwood – Matilda’s ballroom dancing obsessed Mum. Matilda The MusicalÂ is based on the beloved novel by best-selling author Roald Dahl (Charlie and the Chocolate Factory, Fantastic Mr. Fox). It is the story of an extraordinary school girl who, armed with a vivid imagination and a sharp mind, dares to take a stand and change her own destiny. 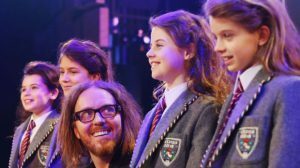 Written by Australian Tim Minchin,Â Matilda The MusicalÂ hadÂ proven enormous success in Londonâ€™s West End and on Broadway, making itâ€™s Australian openingÂ the most-anticipated theatrical event of 2015. 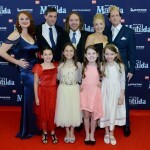 Matilda The MusicalÂ will make its Australian Premiere at Sydney Lyric Theatre from July 28. Man Of La Mancha opens! 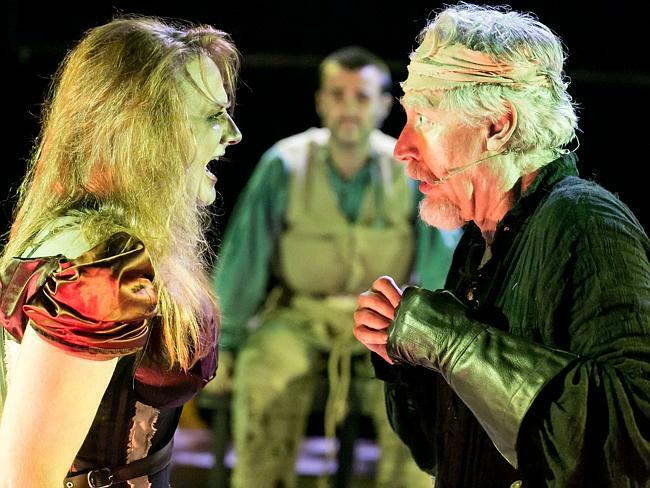 Man Of La Mancha is Squabbalogic’s fastest selling show to date – don’t miss out! BOOK @Â seymourcentre.comÂ or on 02 9351 7940. Man Of La Mancha Cast guests of honour at The GLUGs March Luncheon! Itâ€™s an old clichÃ© but Christmas is a time of giving and Carols by Cabaret at Hayes Theatre Co is an event that sets its sights on doing just that. 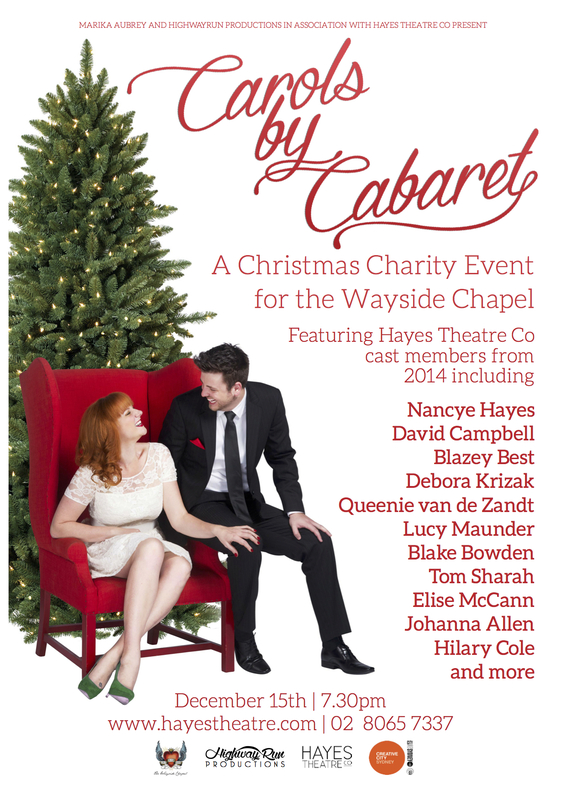 Featuring performances from cast members of shows at Hayes Theatre Co in 2014 , Carols by Cabaret is a Christmas fundraising event that will see all proceeds donated to iconic Potts Point charity, The Wayside Chapel. Each year, thousands of people visit The Wayside for assistance in gaining equitable access to essential health, welfare and related services. 9416 community meals, 6528 changes of clothing and 2131 applications of first aid and health support were administered by the Wayside Chapel staff this year and over 4774 members of the community visited Wayside to learn about theirÂ work. 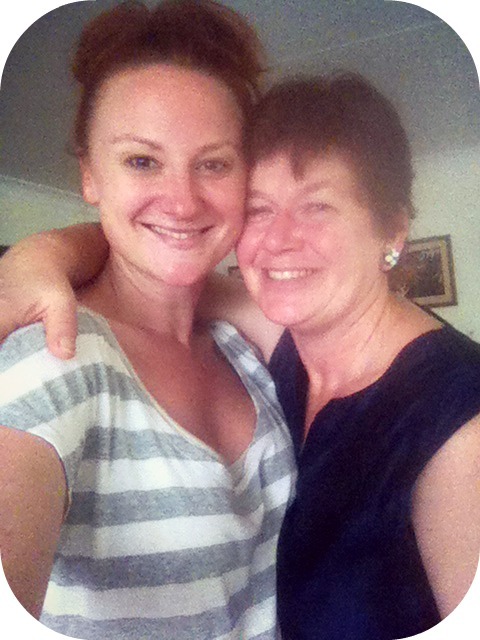 Â Join Marika each month onÂ www.aussietheatre.com.auÂ Â as she meets with a successful Australian artist she deeply admires to informally natter about their process. MIRACLE CITY continues it’s miracle run! Nick Enright and Max Lambertâ€™s musicalÂ Miracle CityÂ presented byÂ Luckiest ProductionsÂ in association withÂ Hayes Theatre CoÂ has opened to rave reviews and will play untilÂ November 16. Miracle City starsÂ Mike McLeishÂ (Keating The Musical, Shane Warne: The Musical) as religious patriarch Ricky Truswell, Blazey BestÂ (NoraÂ &Â Miss Julie, Belvoir) as Lora Lee Truswell, Hilary ColeÂ (Carrie: The MusicalÂ andÂ The Drowsy Chaperone) as Loretta Truswell, Cameron HolmesÂ as Ricky Bob (Mary Poppins), as well as recent NIDA graduateÂ Jason KosÂ as Billy Trengrove,Â Esther HannafordÂ (King Kong, Hairspray) as Bonnie Mae,Â Marika Aubrey(South PacificÂ &Â Last of the Red Hot Mamas) as Eulella,Â Josie LaneÂ (Fame The MusicalÂ andÂ Priscilla, Queen Of The Desert) as Charlene andÂ Peter KowitzÂ as Millard Sizemore (BlackbirdÂ andÂ King Lear). AussieTheatre and Marika Aubrey will be wrapping up the hugely popular feature interview seriesÂ How We Do What We DoÂ this month after a very successful twoÂ years in print. 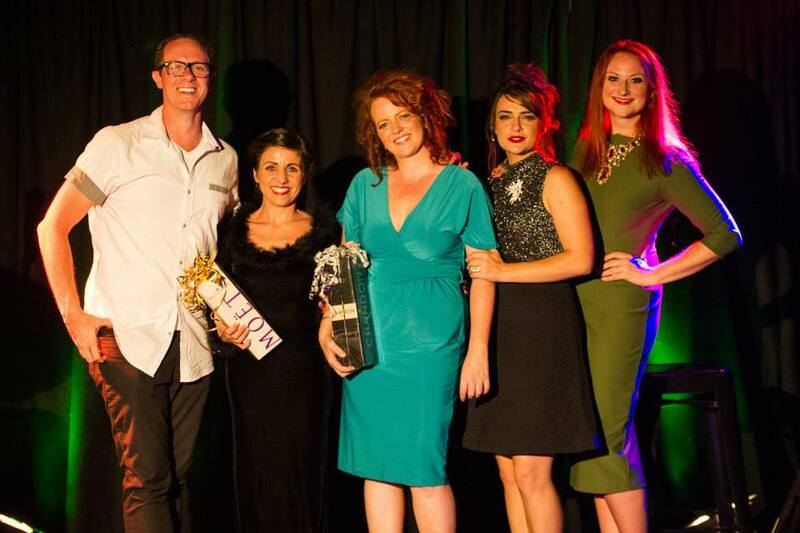 Founded by Aubrey and AussieTheatre in January 2013, the interview series has made AussieTheatre history as the most popular regular column to appear on the website. With over 20,000 readers over the last two years, Aubreyâ€™sÂ in depth and insightful interviews have captured the minds of the Australian and international theatre going public. MIRACLE CITY opens to rave reviews and full houses – HALLELUJAH! 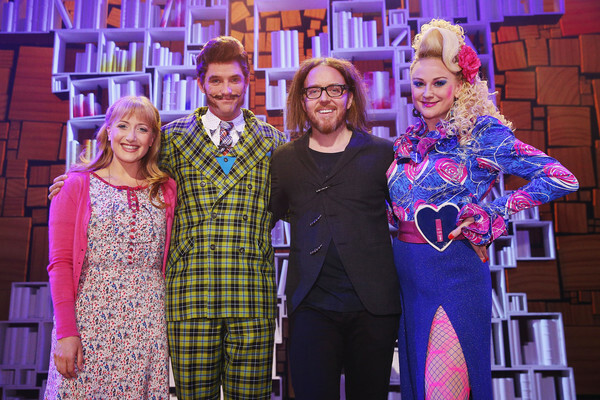 Watch the cast of Miracle City performing ‘Open Up Today’ on Channel 9’s Mornings. Now that’s a wake up call! This month’s chat is withÂ Justine Clarke! 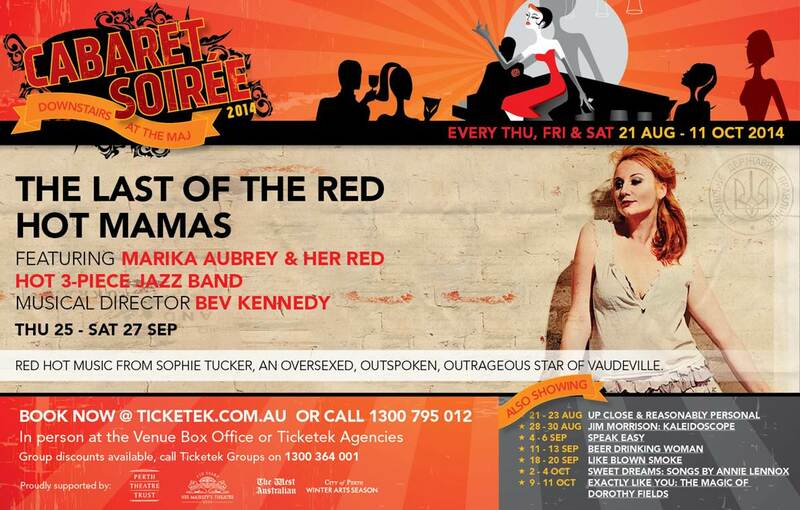 LAST OF THE RED HOT MAMAS has played three sell-out shows as part of the La Soiree Cabaret Festival at His Majesty’s Theatre in Perth! 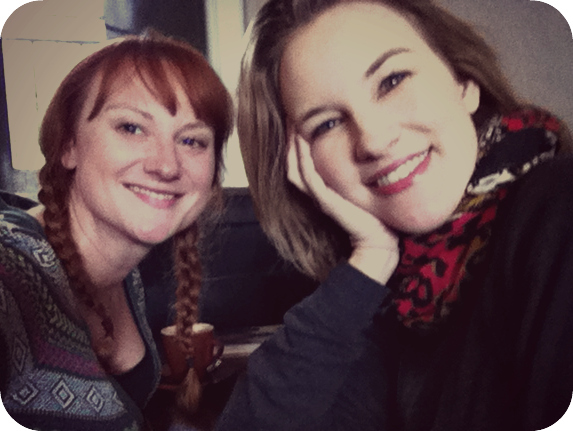 This month’s chat is withÂ Kate Mulvany! 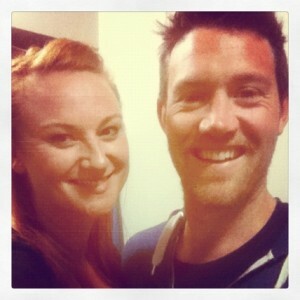 Just found this old radio interview from 2011 on 2SER, with ROB MILLS & I chatting about The Last Five Years. A beautiful reminder of what a joy this production was!!! This month’s chat is withÂ Anna McGahan! Next month LAST OF THE RED HOT MAMAS tours to PERTH! 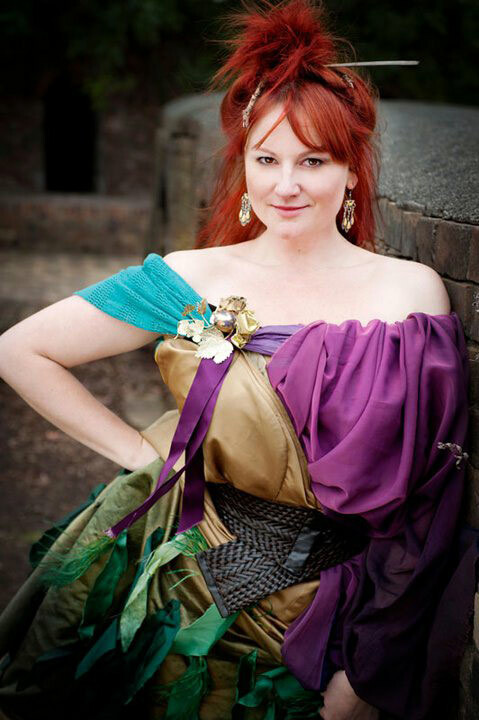 Registrations are now open for the inauguralÂ Cabaret Winter Workshop, presented by Hayes Theatre Co in association with Amazon Woman Enterprises and Queenie van de Zandt. This month’s chat is withÂ Guy Edmonds! Marika to join the cast of MIRACLE CITY!!!! 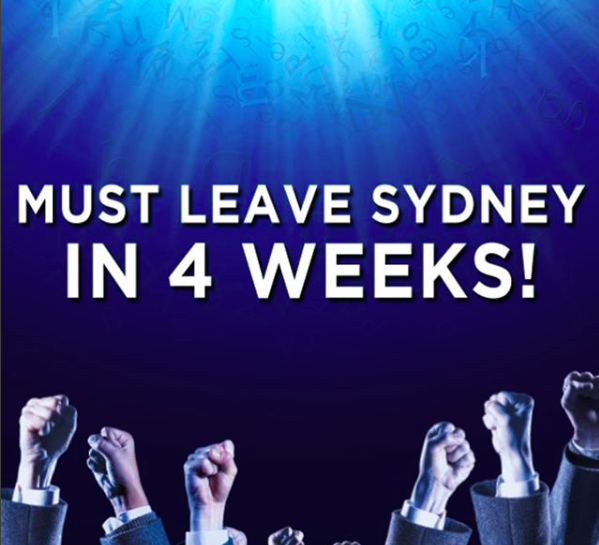 Luckiest ProductionsÂ in association withÂ Hayes Theatre CoÂ will present a brand new production of Nick Enright and Max Lambertâ€™s musicalÂ Miracle CityatÂ Hayes Theatre CoÂ in Sydney fromÂ October 17 â€“ November 16 2014, with tickets going on sale to the general public onÂ Wednesday, 16 July. 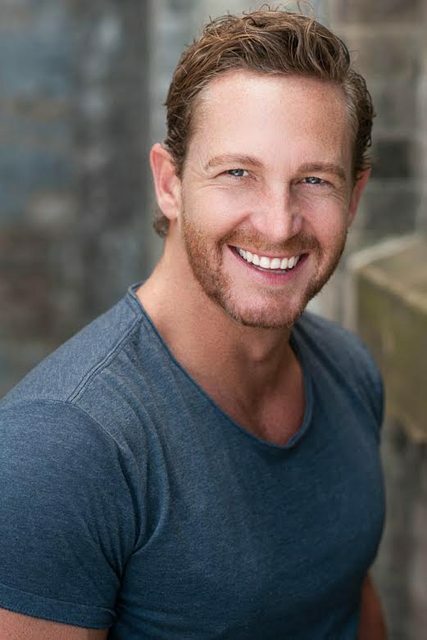 Miracle City will starÂ Mike McLeishÂ (Keating The Musical, Shane Warne: The Musical) as religious patriarch Ricky Truswell,Â Blazey BestÂ (Nora & Miss Julie, Belvoir) as Lora Lee Truswell,Â Hilary ColeÂ (Carrie: The MusicalÂ andÂ The Drowsy Chaperone) as Loretta Truswell, as well as recent NIDA graduateJason KosÂ as Billy Trengrove,Â Esther HannafordÂ (King Kong, Hairspray) as Bonnie Mae,Â Marika AubreyÂ (South PacificÂ &Â Last of the Red Hot Mamas) as Eulella andÂ Josie LaneÂ (Fame The MusicalÂ andÂ Priscilla, Queen Of The Desert) as Charlene. 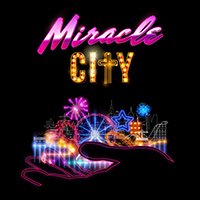 Set in real time during a live-to-air American evangelical television show,Â Miracle CityÂ tells the story of the Truswells, a family with a dream to build a religious theme park, and the extreme lengths the patriarch Ricky Truswell will go to in order to make their dream a reality. Miracle City had its world premiere at the Sydney Theatre Company in 1996 to huge acclaim. This brand new production will be directed byÂ Darren YapÂ -Â The Serpentâ€™s Table, A Murder is Announced, I Love You, Youâ€™re Perfect, Now ChangeÂ – with musical direction byÂ Max LambertÂ -Â Hairspray, King Kong, Strictly BallroomÂ – and choreography byÂ Kelley AbbeyÂ -Â Fame The Musical, Xanadu: The Musical. This month’s chat is withÂ Anne Looby! What do you get when you take 4 leading theatre sports improvisers and put them in a cast with 2 musical theatre special guests? ON THE SPOT MUSICAL. 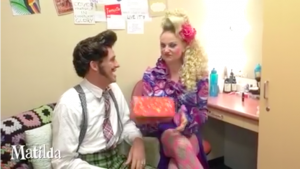 A musical comedy that is literally written before your eyes. 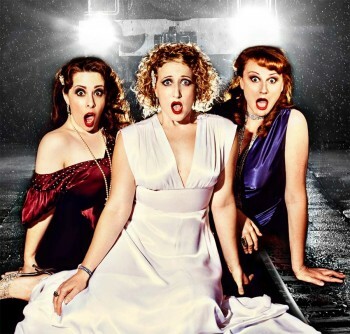 Their cast includes Bridie Connell and Lisa Ricketts – both previous Cranston Cup winners and National Theatresports Champions, as well as Rob Johnson (Mantaur, Carrie: The Musical), and Robert Boddington (2014 Sydney Comedy Festival). Each show they will be joined by Hayes alumni and stars of Sydneyâ€™s independent musical theatre scene, including: Marika Aubrey (Last of the Red Hot Mamas, South Pacific, The Last 5 Years), Blake Erickson ([title of show], Hold Me Closer Logies Dancer) and Mark Simpson (Hairspray, Forbidden Broadway, Rocky Horror). 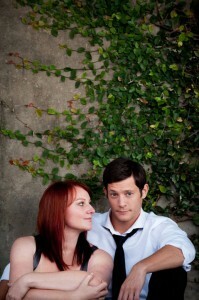 Marika is making a special guest appearance this at the cabaret of leading man heart throb DAVID HARRIS. A monthly artist feature series that explores how we actors do what we do. How do we get started? How do we shape a career? Overcome challenges? 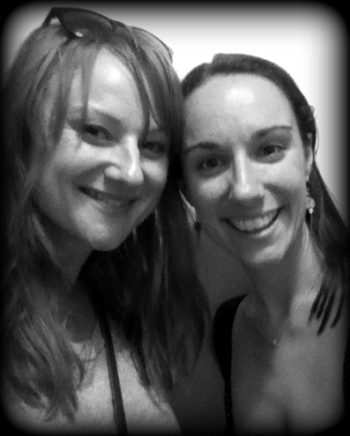 Join Marika each month onÂ www.aussietheatre.com.auÂ Â as she meets with a successful Australian artist she deeply admires to informally natter about their process. This month’s chat is with Katrina Retallick! 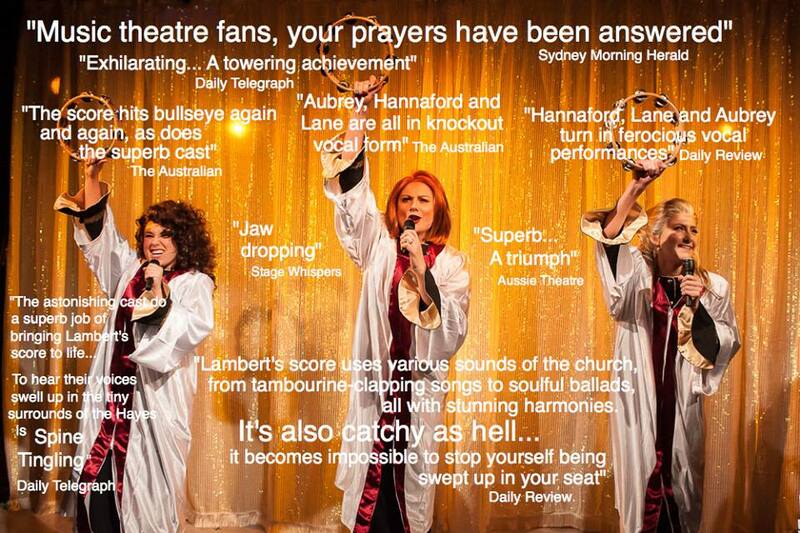 receives excellent reviews from the Sydney press! 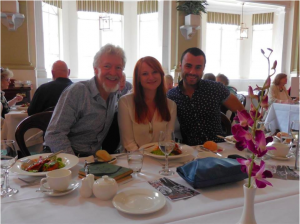 â€œ…Aubrey has a big, clear singing voice, which she uses well…She also has a big personality and commands the small space at the Hayes Theatre Co with ease. 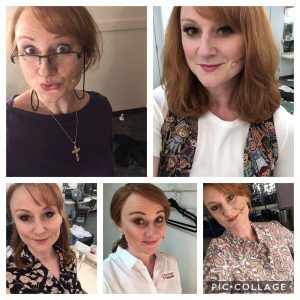 Her patter between the numbers is lively and she develops a warm rapport with the audience… itâ€™s an entertaining show by an assured, engaging performer…If you want to catch it, youâ€™ll need to get cracking as thereâ€™s just one show leftâ€. Â “Aubrey commands this intimate room effortlessly…Aubrey makes Broadway Blues smoulder beautifully, backed by Bev Kennedy on piano, Jamie Castrisos (drums) and Trent Prees (double bass). Her comic performance of Nobody Loves a Fat Girl, (but Oh How a Fat Girl Can Love) is a standout…Last of the Red Hot Mamas is a fine showcase for Aubrey and in the vaudeville tradition, it leaves you wanting more”. 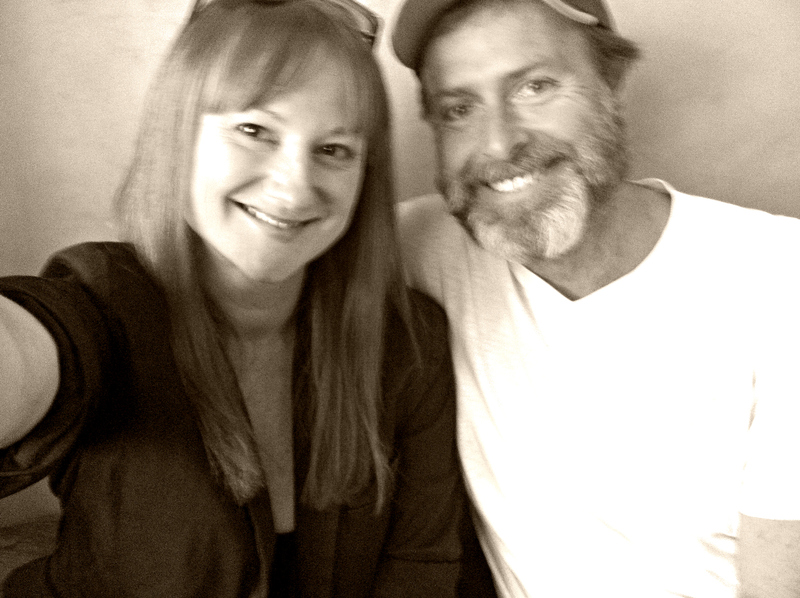 This month’s chat is withÂ Bart John! LAST OF THE RED HOT MAMAS SYDNEY! After a sell out critically acclaimed premiere at The Adelaide Cabaret Festival 2013, LAST OF THE RED HOT MAMAS is playing Sydney FEB 16, FEB23 & MARCH 2 – The FIRST cabaret to open at the newly formed HAYES THEATRE and produced by Neil Gooding Productions & Marika Aubrey. Born dirt poor in 1884 Ukraine, Sophie Tucker overcame humble beginnings to become an oversexed, outspoken, outrageous star of vaudeville in the roaring 20’s. In the same year, in a neighbouring village Fedko Kryczko is born and eventually flees to Australia. Cabaret star Marika Aubrey â€“ and Fedko’s great grand-daughter – sings the red hot music from Sophieâ€™s brilliant career, and tells tales of her own from a country that got left behind. The Last of the Red Hot Mamas transports audiences to a 1920s speakeasy complete with red hot three piece jazz band playing Sophie’s vaudeville hits including ‘Nobody Loves A Fat Girl’, ‘Put Your Arms Around Me Honey’ and ‘After You’ve Gone’. 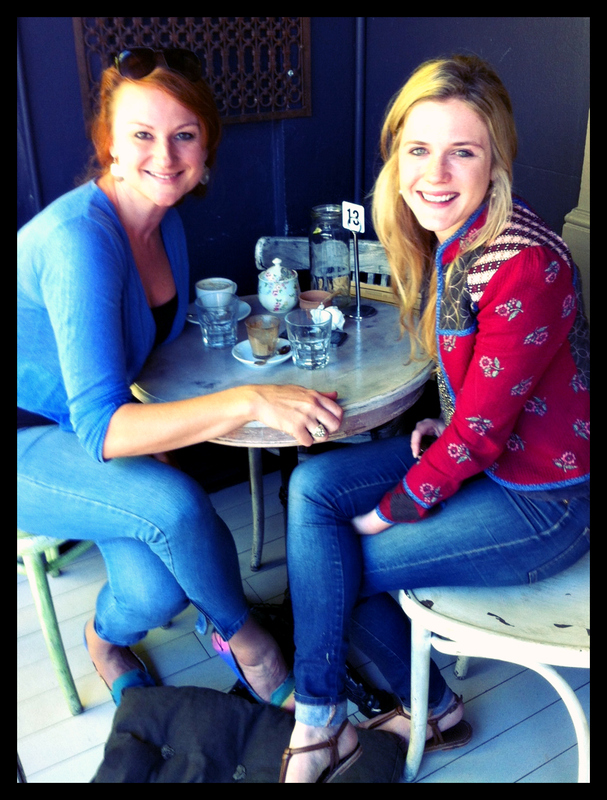 Â This month’s chat is withÂ Harriet Dyer! 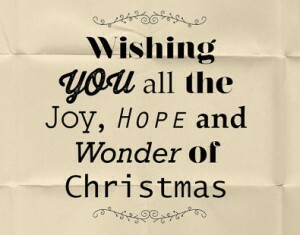 “Wishing you ALL a couple of days of deep gratitude, big laughs and full bellies. 2014 is going to be another huge year of adventure – bring it on! A monthly artist feature series that explores how we actors do what we do. How do we get started? How do we shape a career? Overcome challenges? 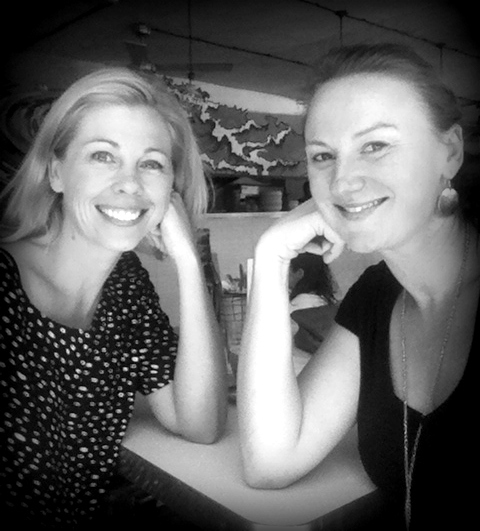 Â Join Marika each month onÂ www.aussietheatre.com.auÂ Â as she meets with a successful Australian artist she deeply admires to informally natter about their process. Â This month’s chat is withÂ Fiona Press! 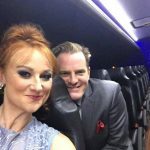 Â This month’s chat is withÂ Gyton Grantley! SOUTH PACIFICÂ is heading to Perth to play Crown Theatre from November 10, for a strictly limited season. 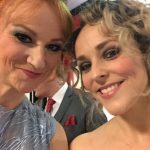 Perth favouriteÂ Lisa McCuneÂ stars as Nellie alongside celebrated baritoneÂ Teddy Tahu RhodesÂ as Emile andÂ Christine AnuÂ as Bloody Mary. Most excitingly, Mitchell Butel joins the cast as Luther Billis! SOUTH PACIFICÂ features a glorious score played by the superbÂ Perth Symphony Orchestra, including magnificent numbersÂ Some Enchanted Evening, There is Nothinâ€™ Like a Dame, Bali Haâ€™I, Younger than Springtime, Happy Talk and Iâ€™m Gonna Wash That Man Right Outa My Hair. 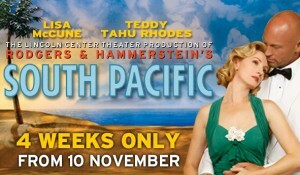 VisitÂ www.southpacificmusical.com.auÂ for news, reviews, music, videos and more details about the show. 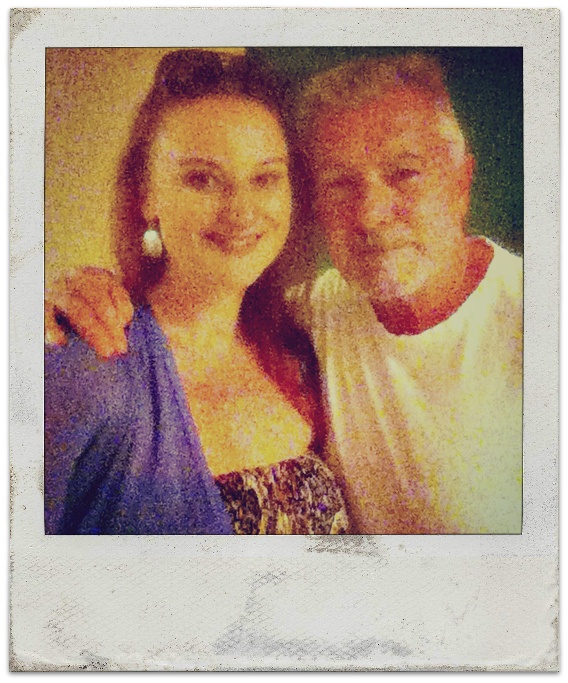 Â This month’s chat is withÂ Anthony Gooley! 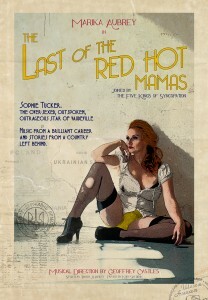 LAST OF THE RED HOT MAMAS – Promo clip to view! 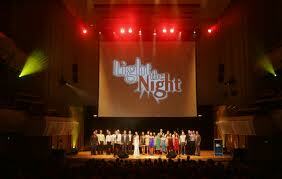 The Light the Night Benefit Concert is inspired by Matthew Rennie and his three year battle with leukaemia.Â Each year talented Australian artists donate their time to help raise money for this much needed cause. This yearâ€™s line-up includes GREASEâ€™s femme fatale Lucy Maunder, drag artiste Trevor Ashley, Red Hot Mama Marika Aubrey, talented songstress Vanessa Raspa & the Zombie Cats,Â I Will SurviveÂ contestant Tom Sharah and musical theatre favourites Tyran Parke and Johanna Allen. 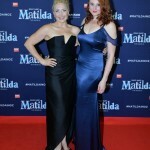 The cast will also includeÂ Emma Pask, Tony Sheldon, Gretel Scarlett, Amelia Ryan, Mitchell Butel, Michael Griffiths, Danny Ross, Adam Rennie, iOTA, Queenie van de Zandt, The Idea of North, Phil Stack, Julie Goodwin, Michael Griffiths and members from the cast ofÂ The Atomic. 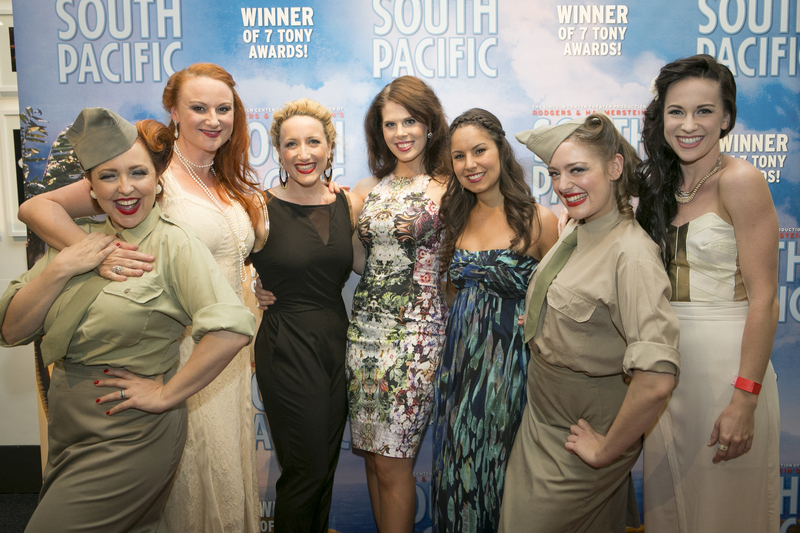 Some enchanted evening – September 12th to be exact – SOUTH PACIFIC made it’s triumphant return to The Sydney Opera House! 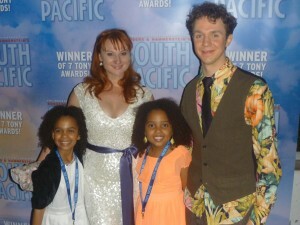 Here are some opening night snaps, along with Rowan Witt (Professor), and the children in the cast. A monthly artist feature series that explores how we actors do what we do. How do we get started? How do we shape a career? Overcome challenges? 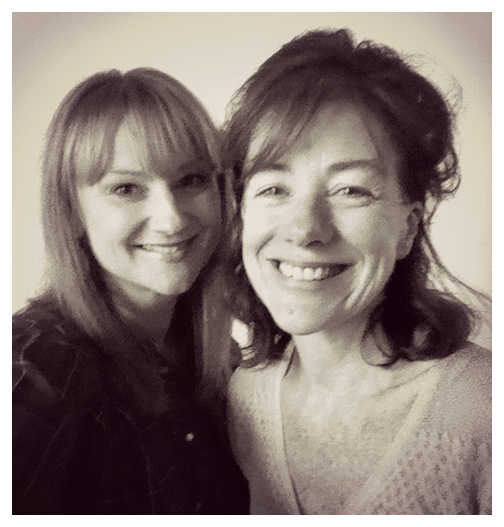 Â Join Marika each month onÂ www.aussietheatre.com.auÂ as she meets with a successful Australian artist she deeply admires to informally natter about their process. A new monthly artist feature series that explores how we actors do what we do. How do we get started? How do we shape a career? Overcome challenges? 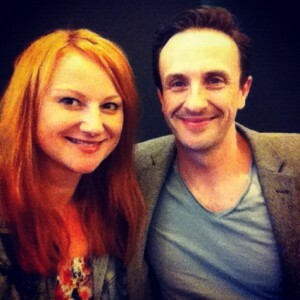 Â Join Marika each month onÂ www.aussietheatre.com.auÂ as she meets with a successful Australian artist she deeply admires to informally natter about their process. 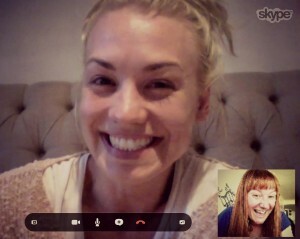 This month’s chat is withÂ Yvonne Strahovski! Hosted by NSW Equity vice president Chloe Dallimore, and with a line-up of over 50 performers, Twisted Broadway will again be proudly donating all proceeds to Oz Showbiz Cares Equity Fights AIDS. 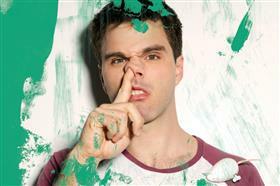 Monday August 19 at NIDA all tickets $55. 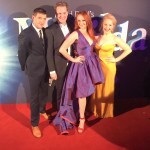 June’sÂ HOW WE DO WHAT WE DOÂ is up on Aussie Theatre! 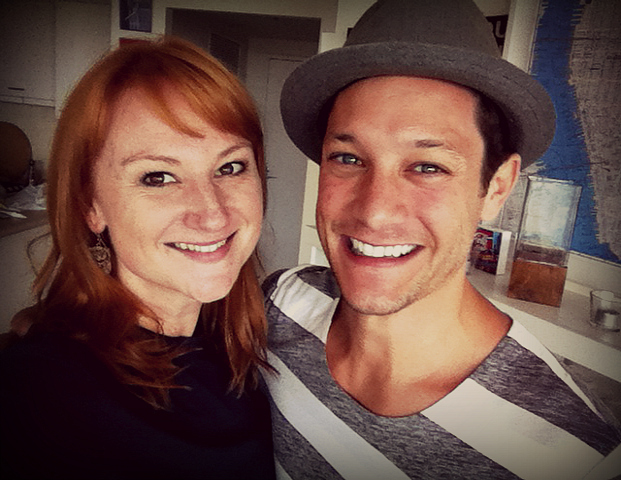 This month’s chat is withÂ Rob Mills! 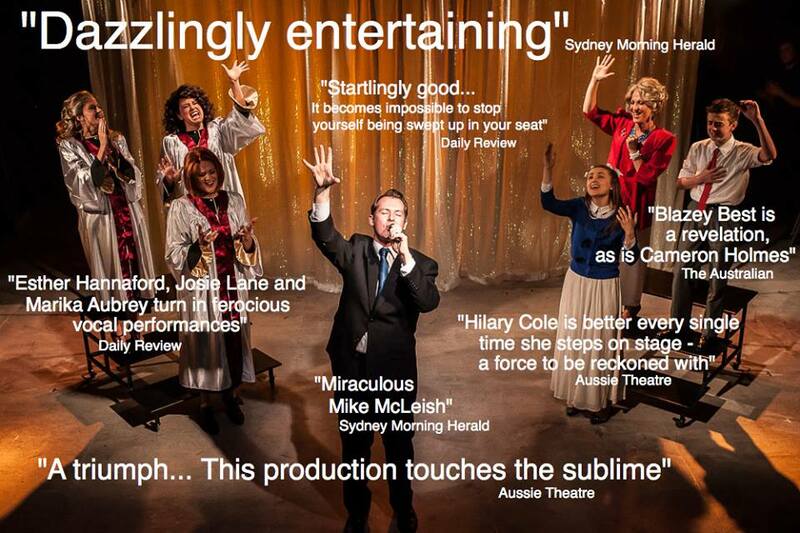 May’sÂ HOW WE DO WHAT WE DOÂ is up on Aussie Theatre! This month’s chat is withÂ Berndette Robinson! 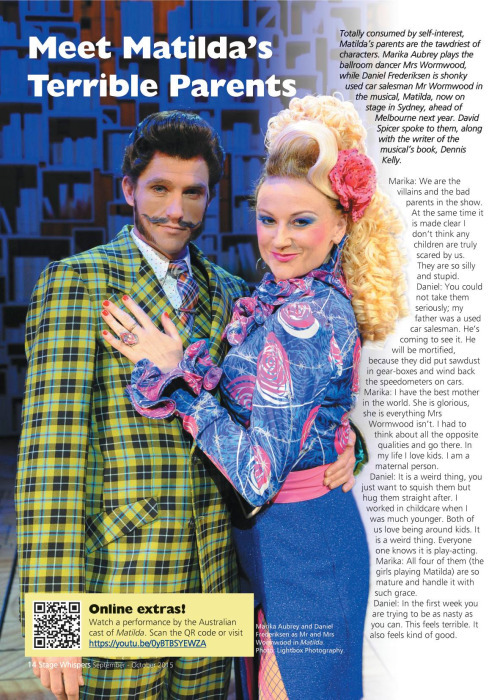 April’sÂ HOW WE DO WHAT WE DOÂ is up on Aussie Theatre! 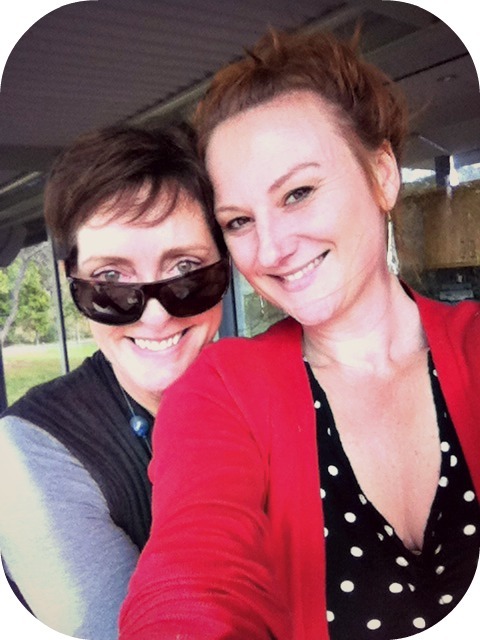 This month’s chat is with Lisa McCune! 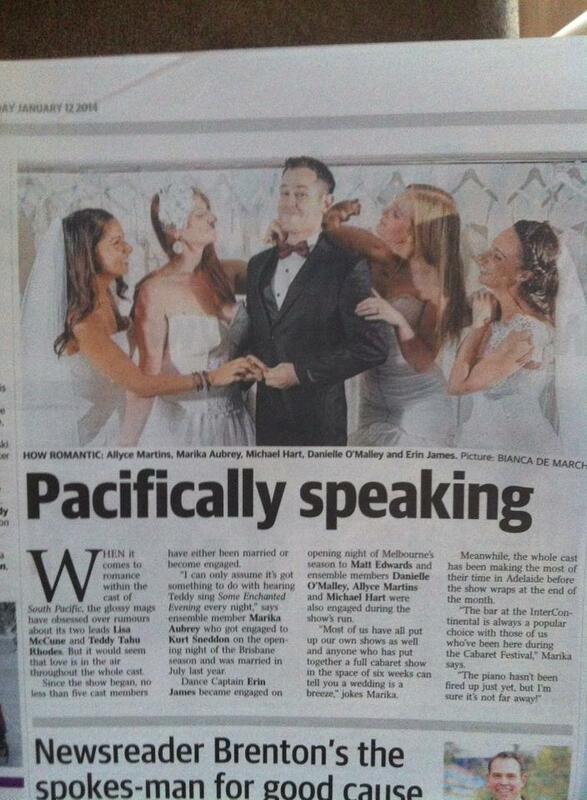 to premiere at the 2013Â Adelaide Cabaret Festival!!! Celebrating the Queen of American Vaudeville… Sophie Tucker -Â oversexed, outspoken and outrageous. 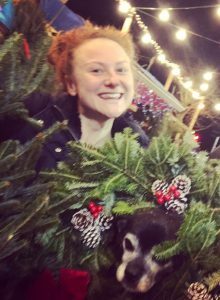 But Sophie’s life started on the side of the road in Ukraine, in a village not many miles away from Marika’s own great-grandfather. 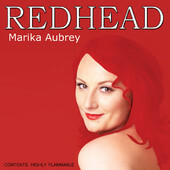 Adelaide Cabaret Festivalâ€™s resident Red Hot Mama, Marika Aubrey sings the songs from Sophieâ€™s brilliant career, highlighting her own personal connections to the country that got left behind. Youâ€™ll be transported to a 1920s speakeasy complete with Sophieâ€™s band The Five Kings of Syncopation lead by Musical Director Geoffrey Castles featuring the hit songs,Â You for Me in the Summertime, The Lady is a TrampÂ and her trademark songÂ Some of These Days. True tales of darkness and joy meet over a bowl of borscht. 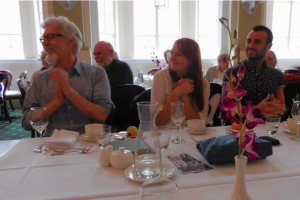 BOOK HERE for June 19 & 20 – The Banquet Room, Adelaide. 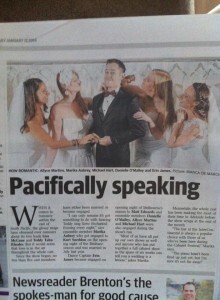 This month’sÂ HOW WE DO WHAT WE DOÂ is up on Aussie Theatre! A new monthly artist feature series that explores how we actors do what we do. How do we get started? How do we shape a career, overcome challenges and be the best at what we do. 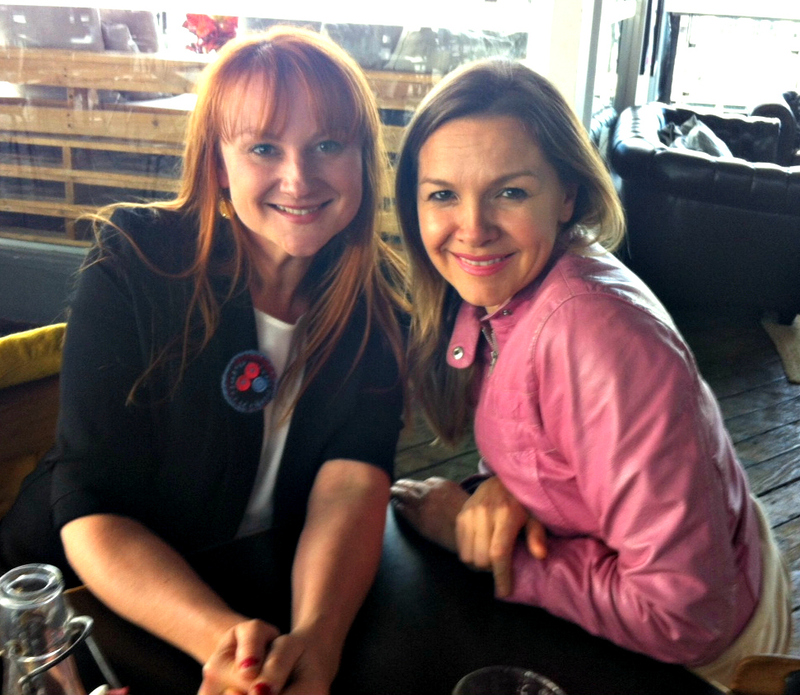 Join Marika each month onÂ www.aussietheatre.com.auÂ as she meets with a successful Australian artist she deeply admires to Â informally chat about their process. 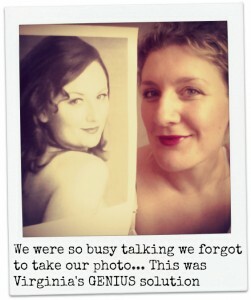 This month I chat to the amazing VIRGINIA GAY! 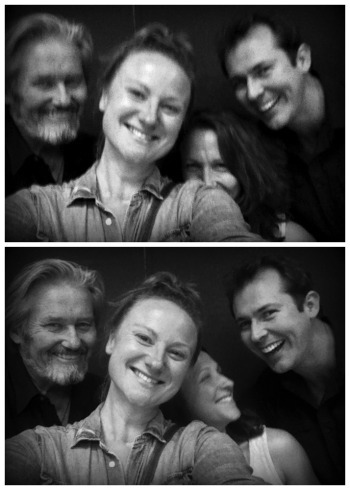 HOW WE DO WHAT WE DOÂ is on Aussie Theatre! Our new monthly artist feature series that explores how we actors do what we do. How do we get started? How do we shape a career, overcome challenges and be the best at what we do. 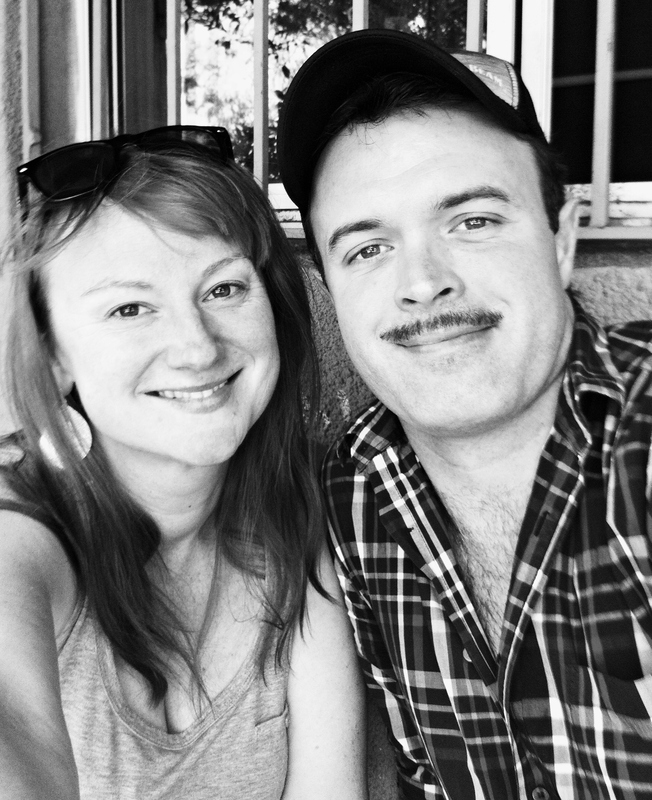 Join Marika each month onÂ www.aussietheatre.com.auÂ as she meets with a successful Australian artist she deeply admires to Â informally chat about their process. January’s HWDWWD is with the incredibleÂ MITCHELL BUTEL! HOW WE DO WHAT WE DO launches on Aussie Theatre! A new monthly artist feature series that explores how we actors do what we do. How do we get started? How do we shape a career, overcome challenges and be the best at what we do. Join Marika each month on www.aussietheatre.com.au as she meets with a successful Australian artist she deeply admires to Â informally chat about their process. This month I chat to the amazing EDDIE PERFECT! 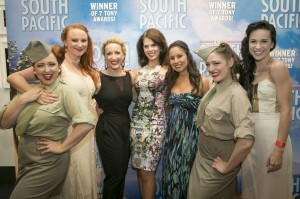 After a SELL-OUT season at Sydney’s Opera House, SOUTH PACIFIC moves south to Melbourne’s beautiful Princess Theatre. Tickets selling fast, book HERE. Marika Aubrey joins the stellar cast of ‘South Pacific’, alongside Lisa McCune, Eddie Perfect, Daniel Koek, Teddy Tahu Rhodes, and Kate Ceberano. 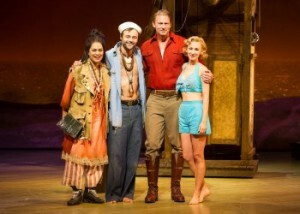 The Australian season ofÂ South Pacificmarks the coming together of Australiaâ€™s largest performing arts company, Opera Australia, with Australiaâ€™s largest commercial theatre producer, John Frost, & will be directed by Bartlett Sher (winner of the 2008 Tony Award and the Drama Desk Award forÂ South Pacific). The all Australian production will be based on the hugely successful NYC Lincoln Centre production & open at The Sydney Opera House in August, before transferring to Melbourne’s Princess Theatre. Book now for Marika’s newest show! 12 SONGS TO SAVE YOUR LIFEÂ -starringÂ Johanna Allen, Elise McCannandÂ Marika AubreyÂ examines the problems of life both big and small – and offers a series of succinct solutions, some seriously hot harmonies, and a delicious array of cheeky musical arrangements byÂ Nigel Ubrihien. These three show-business divas completely re-interpret the music made famous by Bon Jovi, Bieber, and Beyonceâ€¦Â but with a dash of cool jazz, a dollop of soul, and just a little bit of R & B sass. Be it your sexual appetite, your bad reputation, the idiots you work with or the bigger idiots you see on TVâ€¦Join a night of revelry as three divine voices share your problems – guaranteed to save your life! 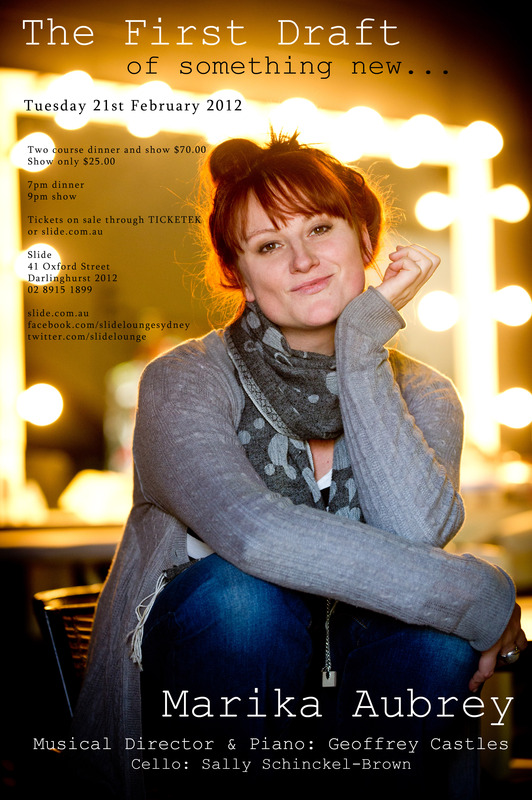 THE SUPPER CLUB – 7pm Doors for an 8pm Show. The redhead from Redhead is back with a brand new show! So new in fact, that she isn’t quite sure what it is…yet. 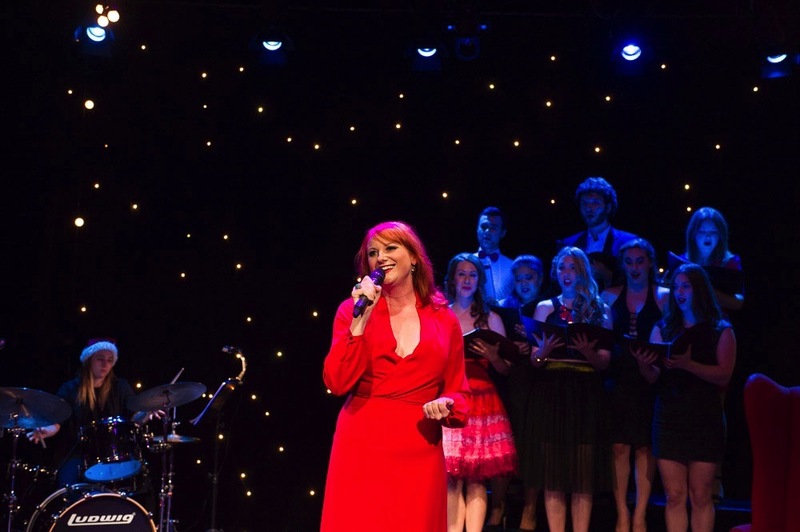 Join the star of THE LAST FIVE YEARS & REDHEAD for a night that celebrates the big voice and big talent we have come to love from one of Australia’s most engaging performers. 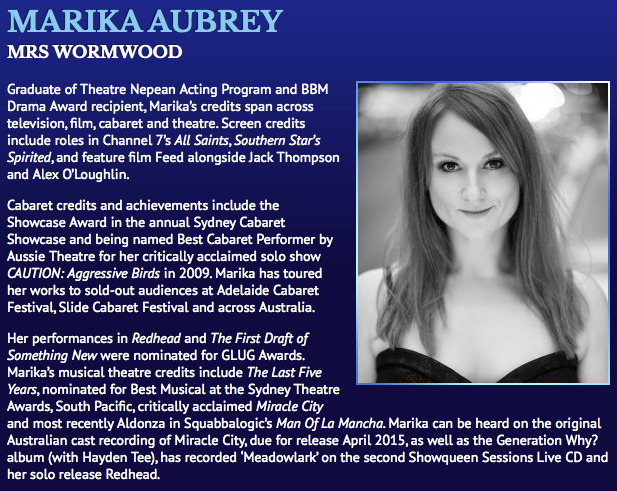 Marika willÂ join aÂ star studded line-up that includes Trevor Ashley, Simon Burke, Paul Capsis, Mark Trevorrow, Ricki-Lee Coulter, Tim Draxl, Lucy Maunder, and Margi de Ferranti – and a 40 piece orchestra – for theÂ 2011 World AIDS Day ConcertÂ on November 21st – To get in and get your tickets, visitÂ here for a fabulous evening! WildRumpuS productions is proud to present the long awaited return of a Sydney spring tradition as one of Shakespeareâ€™s most famous and beloved comedies comes to life in the magical surrounds of Sydneyâ€™s Centennial Park. Bring a rug, a picnic and join us for live music and mother nature at her best – Shakespeareâ€™sÂ A Midsummer Nightâ€™s DreamÂ in Centennial Park is not to be missed! The line-up for 2011’sÂ Light the NightÂ has just been announced! Marika Aubrey joins an all-star cast of performers, in a night that raises money and awareness for leukaemia research. 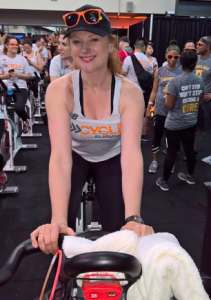 To date, over $200,000 has been donated toÂ The Arrow Bone Marrow Transplant FoundationÂ targeting a cure for leukaemia. 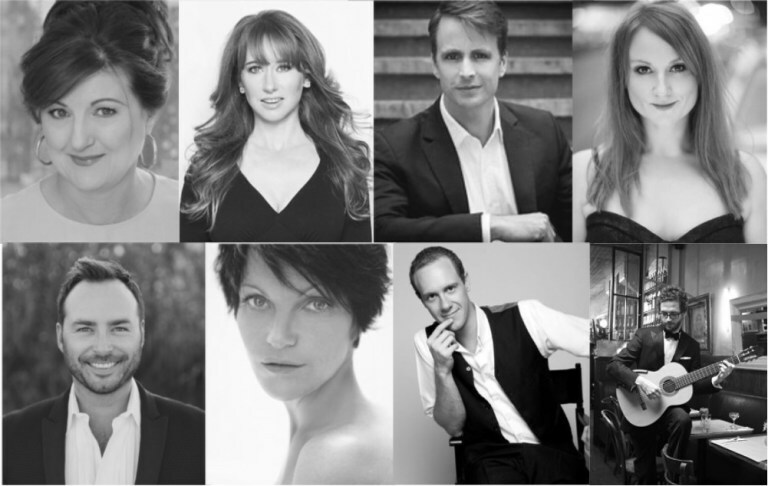 Other performers include: Trevor Ashley, Paul Capsis, Jack Chambers, David Harris, Verity Hunt-Ballard & The cast of Mary Poppins, Lara Mulcahy, Emma Pask & Queenie van de Zandt. 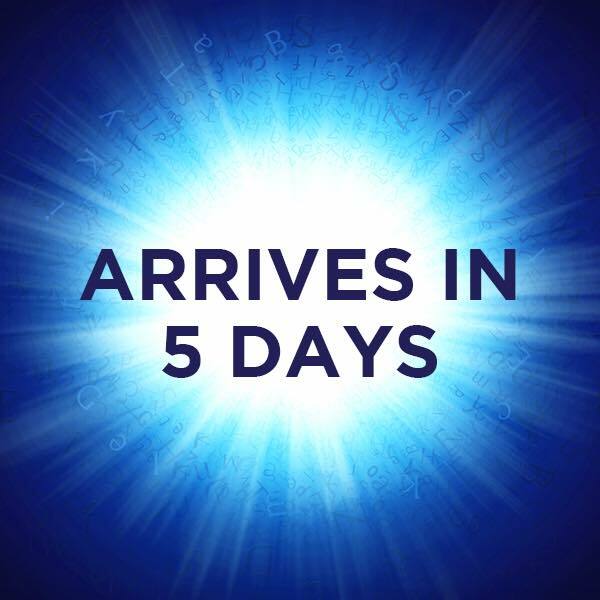 This Thursday 14th July, Marika Aubrey & Rob Mills open the much anticipated production of Jason Robert Brown’s The Last Five Years! Â …And catch a sneak preview from Channel 7’s Morning Show (air date 11/07/11)Â here! REDHEAD the EP is now available through Middle Eight Music! ClickÂ HEREÂ to get you red hot copy now! On May 12th, 2011 it was announced that Marika will star with Rob Mills in a production of Jason Robert Brown’s The Last Five Years. Due to open July 13th at The Seymour Centre’s Reginald Theatre, The Last Five Years is the story of the rise and fall of a young coupleâ€™s relationship told from both sides. 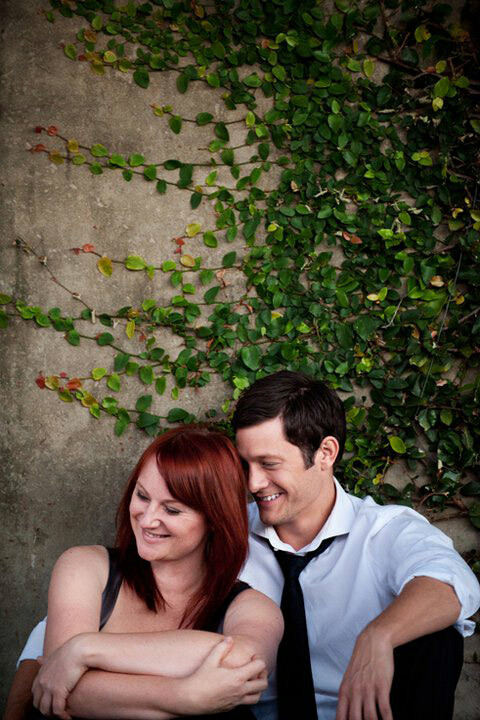 Her story starts at the end of their relationship while his begins on the day they met. Raw, enchanting and bittersweet, this show captures some of the most heartbreaking and uplifting moments of modern romance. Produced by Stories Like These in association with The Seymour Centre, and directed by Luke Rogers. Times:Â Wed â€“ Fri 8pm; Sat 2pm & 8pm; Tue 6:30pm .